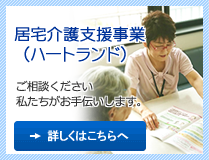 Haramaki-iin provides outpatient clinic, inpatient hospital care, and insurance-related nursing services in Karatsu, Saga. Please check-in or call us by one hour prior to the end of each office hour. The Haramaki-iin was founded in 1933 by Dr. Jitsuichi Haramaki in Funamiya-machi, Karatsu City. It was moved to Daimyokoji and Chiyoda-machi, and then returned to Funamiya-machi, right across the street from the original place, in 1972. From 1951, Dr. Katsuya Haramaki, a son of Jitsuichi, was the director. Then, the current director, Dr. Nobuya Haramaki, took over the position in 2004. In the same year, the current Haramaki-iin building was completed. Currently, two internal medicine specialists including Dr. Nobuya Haramaki and two orthopedics specialists are in charge of both hospitalization and the outpatient departments. 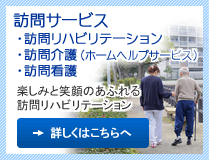 In addition, an insurance-related nursing and rehabilitation section, known as “Day Care”, is conducted on the third floor of the building. 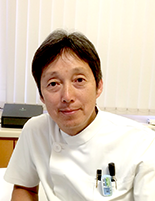 Nobuya Haramaki M.D., Ph.D. is chief physician and director of the clinic, and has practiced in Karatsu for over 13 years. Dr. Haramaki graduated from Kurume University School of Medicine with an M.D. degree in 1987. He started his clinical career as a medical doctor at the Department of Internal Medicine in the Kurume University hospital. He then earned a Ph.D. degree from the University. Dr. Haramaki worked as a researcher at the University of California, Berkeley, in their Department of Molecular and Cell Biology from 1992 to 1995. After returning from the US, Dr. Haramaki continued his previous clinical and scientific work at the Kurume University hospital. His clinical expertise is internal medicine, specializing in cardiology. The main theme in his research was elucidating the mechanism of heart attack by focusing on free radicals, antioxidants, and platelet thrombosis (see Publications listed below). In 2002, Dr. Haramaki became an assistant professor of medicine at Kurume University. He moved back to his hometown of Karatsu and started to direct the Haramaki-iin in 2004. 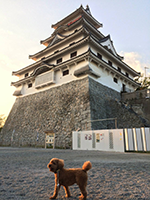 It is Dr. Haramaki’s custom to walk his dog, Indy, every morning and evening. 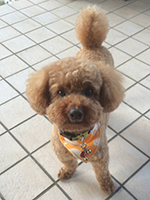 Indy is a 5 year-old male poodle weighing 6 kg. 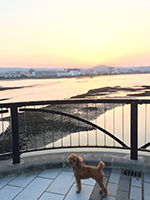 Because they live in the scenic area of Karatsu, they are able to enjoy several wonderful views, such as that of the Karatsu Castle, the bridges at the mouth of Matsuura River, the West and East beaches, and the Rainbow Pinery called “Niji-no Matsubara”. The walking distance is almost 8 km, approximately 5 miles, a day. Five years ago at the beginning, Dr. Haramaki started to take Indy out for the walks, however, he now feels as though Indy is taking him out, in order to maintain his health through daily exercise. Dr. Haramaki also likes surf sports such as surfing, wind surfing, and stand up paddleboarding. When he was younger, he went surfing frequently. Even in California, he often drove across the bay area to Santa Cruz to go surfing. He loved the Santa Cruz coast, a typical California coast, because he always felt that the figure walking down the classic wooden stairs from the cliff with a surfboard was like a scene from a surfing movie. Recently, because he is too busy to seek good conditions for surfing, and since it is too tough to maintain muscle power required for paddling into the waves, he has shifted his interest from surfing to windsurfing. With windsurfing, it is easier to adjust to the weather conditions, such as by using a big sail for light wind or a small sail for strong winds, therefore, there are more chances to have fun. If the wind is too light for windsurfing, stand up paddleboarding is possible these days. Surfing is also possible using a stand up paddleboard if there are adequate waves. The greatest thing is that most of the beaches where Dr. Haramaki likes to pursue his surf hobbies are located within a 15 minutes’ drive from his home. Although his priority on weekends is to spend time with his family, he can easily find a couple of hours to go to the beach. 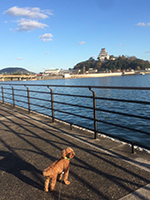 Thus, he enjoys the beautiful beaches of Karatsu while using just a little spare time on weekends. Fluvastatin alters platelet aggregability in patients with hypercholesterolemia: possible improvement of intraplatelet redox imbalance via HMG-CoA reductase. Haramaki N, Ikeda H, Takenaka K, Katoh A, Sugano R, Yamagishi S, Matsuoka H, Imaizumi T. Arterioscler Thromb Vasc Biol. 2007;27(6):1471-7. Platelet P-selectin plays an important role in arterial thrombogenesis by forming large stable platelet-leukocyte aggregates. Yokoyama S, Ikeda H, Haramaki N, Yasukawa H, Murohara T, Imaizumi T. J Am Coll Cardiol. 2005;45(8):1280-6. Polymorphonuclear leukocytes may impair endothelial function: results of crossover randomized study of lipid-lowering therapies. Sugano R, Matsuoka H, Haramaki N, Umei H, Murase E, Fukami K, Iida S, Ikeda H, Imaizumi T. Arterioscler Thromb Vasc Biol. 2005;25(6):1262-7. HMG-CoA reductase inhibitor protects against in vivo arterial thrombosis by augmenting platelet-derived nitric oxide release in rats. Yokoyama S, Ikeda H, Haramaki N, Yasukawa H, Katoh A, Imaizumi T. J Cardiovasc Pharmacol. 2005;45(4):375-81. Only two-week smoking cessation improves platelet aggregability and intraplatelet redox imbalance of long-term smokers. Morita H, Ikeda H, Haramaki N, Eguchi H, Imaizumi T. J Am Coll Cardiol. 2005;45(4):589-94. Inhibition of platelet adherence to mononuclear cells by alpha-tocopherol: role of P-selectin. Murohara T, Ikeda H, Otsuka Y, Aoki M, Haramaki N, Katoh A, Takajo Y, Imaizumi T. Circulation. 2004;110(2):141-8. Statins for heart failure: a potential for new treatment. Haramaki N, Ikeda H. Cardiovasc Res. 2003;60(2):217-9. Vitamin E inhibits lysophosphatidylcholine-induced endothelial dysfunction and platelet activation. Murohara T, Ikeda H, Katoh A, Takajo Y, Otsuka Y, Haramaki N, Imaizumi T. Antioxid Redox Signal. 2002;4(5):791-8. Coexistence of impairment of endothelium-derived nitric oxide and platelet-derived nitric oxide in patients with coronary risk factors. Katoh A, Ikeda H, Takajo Y, Haramaki N, Murohara T, Shintani S, Kanaya S, Yokoyama S, Ueno T, Honma T, Imaizumi T. Circ J. 2002;66(9):837-40. Steroid therapy and urinary transforming growth factor-beta1 in IgA nephropathy. Haramaki R, Tamaki K, Fujisawa M, Ikedo H, Haramaki N, Okuda S. Am J Kidney Dis. 2001;38(6):1191-8. Intraplatelet tetrahydrobiopterin plays an important role in regulating canine coronary arterial thrombosis by modulating intraplatelet nitric oxide and superoxide generation. Kanaya S, Ikeda H, Haramaki N, Murohara T, Imaizumi T. Circulation. 2001;104(20):2478-84. Long-term smoking causes nitroglycerin resistance in platelets by depletion of intraplatelet glutathione. Haramaki N, Ikeda H, Takajo Y, Katoh A, Kanaya S, Shintani S, Haramaki R, Murohara T, Imaizumi T. Arterioscler Thromb Vasc Biol. 2001;21(11):1852-6. Augmented oxidative stress of platelets in chronic smokers. Mechanisms of impaired platelet-derived nitric oxide bioactivity and augmented platelet aggregability. Takajo Y, Ikeda H, Haramaki N, Murohara T, Imaizumi T. J Am Coll Cardiol. 2001;38(5):1320-7. Abnormal myocardial blood flow distribution in patients with angina pectoris and normal coronary arteriograms. Shiraishi A, Ikeda H, Haramaki N, Murohara T, Matsumoto T, Ueno T, Imaizumi T. Jpn Circ J. 2000;64(8):566-71. Platelet-derived nitric oxide and coronary risk factors. Ikeda H, Takajo Y, Murohara T, Ichiki K, Adachi H, Haramaki N, Katoh A, Imaizumi T. Hypertension. 2000;35(4):904-7. Coronary sinus long sheath catheter system: a new device for transfemoral coronary sinus catheterization. Ueno T, Kai H, Ikeda H, Matsumoto T, Murohara T, Haramaki N, Eguchi H, Kato A, Takajo Y, Onitsuka I, Imaizumi T. Heart Vessels. 1999;14(4):201-4. Adhesive interaction between P-selectin and sialyl Lewis(x) plays an important role in recurrent coronary arterial thrombosis in dogs. Ikeda H, Ueyama T, Murohara T, Yasukawa H, Haramaki N, Eguchi H, Katoh A, Takajo Y, Onitsuka I, Ueno T, Tojo SJ, Imaizumi T. Arterioscler Thromb Vasc Biol. 1999;19(4):1083-90. Endothelial injuries of coronary arteries distal to thrombotic sites: role of adhesive interaction between endothelial P-selectin and leukocyte sialyl LewisX. Eguchi H, Ikeda H, Murohara T, Yasukawa H, Haramaki N, Sakisaka S, Imaizumi T. Circ Res. 1999;84(5):525-35. Intra-coronary administration of L-arginine aggravates myocardial stunning through production of peroxynitrite in dogs. Mori E, Haramaki N, Ikeda H, Imaizumi T. Cardiovasc Res. 1998;40(1):113-23. Platelet-derived 12-hydroxyeicosatetraenoic acid plays an important role in mediating canine coronary thrombosis by regulating platelet glycoprotein IIb/IIIa activation. Katoh A, Ikeda H, Murohara T, Haramaki N, Ito H, Imaizumi T. Circulation. 1998;98(25):2891-8. Networking antioxidants in the isolated rat heart are selectively depleted by ischemia-reperfusion. Haramaki N, Stewart DB, Aggarwal S, Ikeda H, Reznick AZ, Packer L. Free Radic Biol Med. 1998;25(3):329-39. Oxidative stress is related to exercise intolerance in patients with heart failure. Nishiyama Y, Ikeda H, Haramaki N, Yoshida N, Imaizumi T. Am Heart J. 1998;135(1):115-20. Vasospastic angina induced by nonsteroidal anti-inflammatory drugs. Mori E, Ikeda H, Ueno T, Kai H, Haramaki N, Hashino T, Ichiki K, Katoh A, Eguchi H, Ueyama T, Imaizumi T. Clin Cardiol. 1997;20(7):656-8. Effects of monoclonal antibody to P-selectin and analogue of sialyl Lewis X on cyclic flow variations in stenosed and endothelium-injured canine coronary arteries. Ueyama T, Ikeda H, Haramaki N, Kuwano K, Imaizumi T. Circulation. 1997;95(6):1554-9. Cytosolic and mitochondrial systems for NADH- and NADPH-dependent reduction of alpha-lipoic acid. Haramaki N, Han D, Handelman GJ, Tritschler HJ, Packer L. Free Radic Biol Med. 1997;22(3):535-42. Long-term smoking impairs platelet-derived nitric oxide release. Ichiki K, Ikeda H, Haramaki N, Ueno T, Imaizumi T. Circulation. 1996;94(12):3109-14. Iron coordination by catechol derivative antioxidants. Kawabata T, Schepkin V, Haramaki N, Phadke RS, Packer L. Biochem Pharmacol. 1996;51(11):1569-77. Efficacy of Bio-Catalyzer alpha.rho no.11 (Bio-Normalizer) supplementation against peroxyl radical-induced oxidative damage in rat organ homogenates. Marcocci L, D'Anna R, Yan LJ, Haramaki N, Packer L. Biochem Mol Biol Int. 1996 Mar;38(3):535-41. The influence of vitamin E and dihydrolipoic acid on cardiac energy and glutathione status under hypoxia-reoxygenation. Haramaki N, Assadnazari H, Zimmer G, Schepkin V, Packer L. Biochem Mol Biol Int. 1995;37(3):591-7. Role of ascorbate in protection by nitecapone against cardiac ischemia-reperfusion injury. Haramaki N, Stewart DB, Aggarwal S, Kawabata T, Packer L. Biochem Pharmacol. 1995;50(6):839-43. Bio-Catalyzer alpha . rho No. 11 (Bio-Normalizer) supplementation: effect on oxidative stress to isolated rat hearts. Haramaki N, Marcocci L, D'Anna R, Yan LJ, Kobuchi H, Packer L. Biochem Mol Biol Int. 1995;36(6):1263-8. Reduction and transport of lipoic acid by human erythrocytes. Constantinescu A, Pick U, Handelman GJ, Haramaki N, Han D, Podda M, Tritschler HJ, Packer L. Biochem Pharmacol. 1995;50(2):253-61. Glutathione reductase and lipoamide dehydrogenase have opposite stereospecificities for alpha-lipoic acid enantiomers. Pick U, Haramaki N, Constantinescu A, Handelman GJ, Tritschler HJ, Packer L. Biochem Biophys Res Commun. 1995;206(2):724-30. Protective effects of riboflavin and its derivatives against ischemic reperfused damage of rat heart. Kotegawa M, Sugiyama M, Haramaki N. Biochem Mol Biol Int. 1994;34(4):685-91. DNA single-strand breaks and cytotoxicity induced by chromate(VI), cadmium(II), and mercury(II) in hydrogen peroxide-resistant cell lines. Tsuzuki K, Sugiyama M, Haramaki N. Environ Health Perspect. 1994;102 Suppl 3:341-2. Effects of natural antioxidant ginkgo biloba extract (EGB 761) on myocardial ischemia-reperfusion injury. Haramaki N, Aggarwal S, Kawabata T, Droy-Lefaix MT, Packer L. Free Radic Biol Med. 1994;16(6):789-94. Cardiac recovery during post-ischemic reperfusion is improved by combination of vitamin E with dihydrolipoic acid. Haramaki N, Packer L, Assadnazari H, Zimmer G. Biochem Biophys Res Commun. 1993;196(3):1101-7. Influence of o-phenanthroline on DNA single-strand breaks, alkali-labile sites, glutathione reductase, and formation of chromium(V) in Chinese hamster V-79 cells treated with sodium chromate (VI). Sugiyama M, Tsuzuki K, Haramaki N. Arch Biochem Biophys. 1993;305(2):261-6. Effect of alpha-tocopherol on high energy phosphate metabolite levels in rat heart by 31P-NMR using a Langendorff perfusion technique. Kotegawa M, Sugiyama M, Shoji T, Haramaki N, Ogura R. J Mol Cell Cardiol. 1993;25(9):1067-74. DNA single-strand breaks and cytotoxicity induced by sodium chromate(VI) in hydrogen peroxide-resistant cell lines. Sugiyama M, Tsuzuki K, Haramaki N. Mutat Res. 1993;299(2):95-102. Studies on the hepatotoxicity induced by bis (tributyltin) oxide. Yoshizuka M, Hara K, Haramaki N, Yokoyama M, Mori N, Doi Y, Kawahara A, Fujimoto S. Arch Toxicol. 1992;66(3):182-7. Mechanism of lipid radical formation following exposure of epidermal homogenate to ultraviolet light. Ogura R, Sugiyama M, Nishi J, Haramaki N. J Invest Dermatol. 1991;97(6):1044-7. Electron spin resonance studies on the mechanism of adriamycin-induced heart mitochondrial damages. Ogura R, Sugiyama M, Haramaki N, Hidaka T. Cancer Res. 1991;51(13):3555-8. Corneal edema induced by bis (tributyltin) oxide. Yoshizuka M, Haramaki N, Yokoyama M, Hara K, Kawahara A, Umezu Y, Araki H, Mori N, Fujimoto S. Arch Toxicol. 1991;65(8):651-5. Copyright © HARAMAKI CLINIC. All Rights Reserved.